Last week we look at how well square wheels work… as long as you have the right sort of surface. Here is a clip from the BBC series “Bang Goes the Theory”, in which Jem Stansfield attempts to become the first person ever to jump a forty-five degree ramp on a square wheeled motorbike. He is not going to jump over any buses (or even rhombuses), but it is still quite an achievement. If you ask a random person on the street to name a shape that rolls smoothly, then they will all say a circle, or perhaps a disc. However, you now know that a square will roll smoothly, as long as the surface it rolls on has the correct shape. But what if we demand that the surface is smooth and flat? Are we restricted to circles? The answer is “no”, as this video by science explorer Steve Mould explains. 2.1 The 50p coin and the 20p coin are both 7-sided shapes of constant width? Why is that better than the coins being regular heptagons? They roll better in vending machines. They avoid corners, so they cause less pain to fingers. They appear to be round, so look more like all the other coins. They flip better and are less likely to land on their edges. I really couldn’t think of a fourth wrong answer. 2.2 The 2017 £1 coin has 12 sides. Because it has an even number of sides, it cannot be a shape of constant width... and you might want to have a think about why an even number of sides is incompatible with having a constant width. However, to earn your two points, you just have to measure the difference between the narrowest and widest “diameters” of a £1 coin. What is the difference between the narrowest and widest “diameters” of a £1 coin? The new £1 coin has a variable width, between 23.03mm and 23.43mm. 2.3 Which country (very appropriately) had a coin in the shape of a Reuleaux triangle? 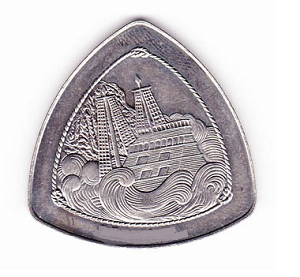 It is very appropriate that Bermuda has a triangular coin, because of the infamous Bermuda Triangle, where ships were said to disappear. Interestingly, there are lots of reasons to doubt the superstitious beliefs about the Bermuda Triangle, as ships and planes are no more likely to go missing in that area than in any other part of the ocean. If you’re interested, you can read more about rational explanations for the Bermuda Triangle here. 2.4 Take a look at this clip showing a bicycle with unusually shaped wheels. In relation to the bike in the video, which of these statements is false? Only one wheel is a Reuleaux triangle. The axles move up and down relative to the ground. The axles move up and down relative to the cyclist. The ride is smooth because the frame rests on the wheels, not the axles. The effect of the odd wheel shape is cancelled by the uneven road to give a smooth ride.